For the intrepid, Peru has more to offer than Ceviche, Machu Picchu and coca leaves. Good weather, great food and fantastic outdoor possibilities have drawn visitors for decades. 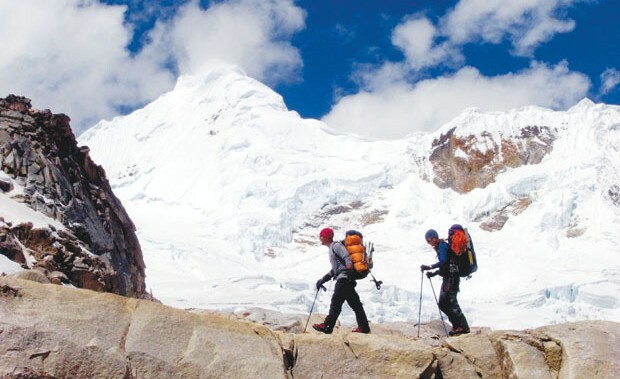 But it wasn’t until the collapse of Maoist Sendero Luminoso insurrection in the late-1990’s, that the Cordillera Blanca became safely re-accessible to adventure tourists. It’s a big deal. The Blanca offers fun-sized Himalayan trekking and climbing, without the jet-lag, big budget and major time commitment of the Himalayas or Alps. Picture 16 6,000-meter peaks and 17 above 5,500 meters in an area 13 miles wide and 112 miles long. Fly to Lima. No visa required. Take cheap and luxurious overnight bus to Huaraz — Cruz del Sur or Movil Tours. Stay in Huaraz. At 3,000 meters/10,000 feet, allow three days acclimatization. Organize gear, food, etc. Canister fuel and white gas available in several outdoor shops. Vast indoor food market—Mercado Central—has everything from fresh seafood (Fridays), to Cuy (guinea pig), to Snickers bars. Take bus (collectivo) or hired car to trailhead—usually no more than a few hours. Hike to basecamp or begin trek. Given the exceptionally stable weather, it’s possible to climb almost any peak, or do two amazing treks on a three-week trip, doorstep to doorstep from the U.S. I’ve personally seen one climber come from Colorado, scale her first 6000-meter peak, and fly home, all within a ten-day round trip. I suggest a more leisurely approach! Peru offers first world amenities, some at third world prices. Overall budget depends on duration of visit and objective. Costs can be split among group. Plan on $1600/$2500, not counting Incan silver jewelry, funky alpaca headgear and Pisco Sours at the Tambo (Huaraz’ best dance club). Though home to many of the most beautiful peaks in the world, most climbers gravitate towards Huascaran (highest in the Blanca —6,768 meters/22,205 feet), Pisco Oeste (approachable and technically easy—5,752 meters/18,870 feet), Tocllaraju (6032 meters/19,790 feet), or Alpamayo (5,947 meters/19,511 feet). Excellent rock climbing from untapped big walls, long free routes and bouldering abound. Pre-Hispanic trails offer excellent trekking throughout the year. Wild flora, fauna, mountains, canyons, archaeological sites and villages abound. Suggested treks include the popular five-day Santa Cruz Trek (spectacular lakes, peaks and a 15,748 foot pass) and 11-day Huayhuash Circuit (crossing high passes over the spine of the Andes). —Pete Takeda is a climber, screenwriter and film producer. He lives in Boulder.